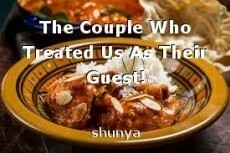 The Couple Who Treated Us As Their Guest! on my blog https://mylegacyindia.blogspot.in/ and had a good review from friends. Food is one thing that connects humanity. Once we were on a group travel after a long working hours of same daily routine week after week in Manali. The salubrious atmosphere of the place were reinvigorating our mind, body and soul. After taking a trek of three kilometer we took a chilled bath in gorging river 'Vyas.' Having a hefty breakfast we were traveling full day by walking at different view points and enjoying our second day of the trip. In night our dinner could not be served by our guest house as we were too late and our host had nothing left to fill our appetite. We searched for time out side for something to eat as it's a common trait that outcircuit of hilly areas closes early in night hours. Just a grocery shop was open beside our guest house. The shop was run by two old couples and there was nothing significant to eat. But knowing ourselves for some after chit-chatting, they understood our problem and offered their hospitality to serve us food with whatever they had cooked for themselves. They had cooked a very tasty Chicken which was served with chilled biers that they used to keep for themselves. I tell you that was the most delicious food and hospitality I have ever enjoyed in my life without paying a single penny. So I tell everybody that Food is one thing that connects humanity. © Copyright 2019 shunya. All rights reserved. Ian goes to north central park on magic mushrooms. The Synthetic experience of an E-Cigarette.